Mahatma Gandhi wasn’t entirely stupid when he embarked on that hunger-strike. He knew pretty much that his life was ebbing away like the tip of a lit cigarette with every passing day. Yet, he persisted until the British bowed to his demands. Mandela’s case might even draw a tear. He was repeatedly offered unconditional freedom – in exchange for the abolition of his campaign. He didn’t need a prophet to tell him that his body was dying fast (and his mind, even faster) in the rat-hole he was in. Yet, he held on – for 27 years. “I will not ………, for my people“. Imagine if he had said “Oga! Egbon! Alaye! Psss! Ehn you! Abeg come, now. You see, maybe we got off on the wrong foot. The short man in the other cell is the brain behind all this! He funded the campaign and threatened my family. I never meant to defy your authority! Let’s sort this thing out amicably. Win-Win for everybody”. Once I was on the field for a game of soccer and a new guy was elected to take us through the stretch routines. According to him, he was a veteran player-turned-coach. The drill was so fantastic my hamstrings tingled with rhythmic delight. As I stared down at my yellow boots, I couldn’t help thinking “correct! This dude’s gonna make a world star out of me”. Everyone was fired up when we literally got the ball rolling. Play was stopped from time to time as “coachie” kept yelling stern words from the by-line. After a while, by his instructions, we had to switch to spot-kick training. The boys weren’t really happy with that – and that was evident in our performance. “No no no! You can’t hit a ball like that and expect to score!”. “You have to bend it round the wall – and, keep it down”. Finally, “coachie” had seen enough; he was now going to show us. “This is how you play a spot-kick. You place the ball down and hiiii….” You guessed it! “Coachie” slipped and fell. “Ok. It happens to the very best – even John Terry”, I thought. He got up to try again, but his subsequent attempts convinced me he wasn’t seeing clearly. The imaginary post he was aiming at was at least three times the physical one. It became obvious that “coachie” was all talk! I’ll let you figure out how that day ended for him. Still, I should tell you this: by the time we met on the pitch again, he had gone from “my coachie” to “bros”. There is nothing easier than pointing the gun at the head of a “rookie who won’t be missed” in Russian Roulette – but, can you hold it to yours? Can you pay the price to make tomorrow what you’d have it be? Do you get your hands dirty – or are you the guy who wears MJ-gloves while pointing and whining “hey! Dig this side well”? Know this, though: no one follows a leader without a story. If you’ve never been there, you won’t be trusted to walk people through it. The only difference between leaders and bullies lies in how they play. A bully plays with the gun to the heads of others. There’s always someone to blame – and beat. “How come we lost that contract? That darn receptionist must have disgusted him. She talks too much. Tell her she’s fired”. A leader plays with the gun to his own head! “What did I do wrong? I can do this. It will work for me.” A leader believes so much in the cause that he points the gun at his own head. I won’t fail. The bullet’s not in this chamber. But, if I do fail, I’m proud to go out fighting. This legacy is worth dying for. Click!!!! It’s common knowledge that leaders are held in high esteem – head and shoulders above the rest. Still, few know this truth: leaders are normal people borne high on the ladders of responsibilities that once dirtied their hands. Forget the bulging tummy. That general was once a private; he once did those gruesome drills. He once shed tears – but he didn’t quit! No one was born to be a bully. Tides turn fairly fast for that set of beings – and they soon begin to feel the brunt of life’s fury. We were all made to lead, but we sometimes do it wrong. You don’t lead with the gloves on! You take them off – and prepare to dirty those hands (again). It’s for the leaders-in-training around you to make sure your hands stay free of filth. When I watched my dad slip his disc while heaving two (30-to-a-bag) 9-inch blocks (in spite of the many in his employ), I realized my “boss’s-son” status was all a spurious scheme to keep my gloves on! I had been a fool! How wrong of me to confuse leadership with status! Leadership lies in service; it’s from service that elevation comes. There is nothing more inspiring than seeing the person with the most at stake bidding highest! If Jesus had called out from a float, peter would never have launched out on foot. A leader must demonstrate, above all else, courage; an ability and willingness to take risks for the cause! You can’t just lie there and wait for tomorrow; a true leader (as we all should be) doesn’t stand akimbo – waiting for others (or life) to make things happen! A leader takes hand-staining responsibility. Would you rather someone else paid the price for your mistakes? Or would you stand up and take responsibility – for all the shame, for all the loss, and maybe some glory? Does the hand that pulls the trigger belong to the head to which the gun is aimed? 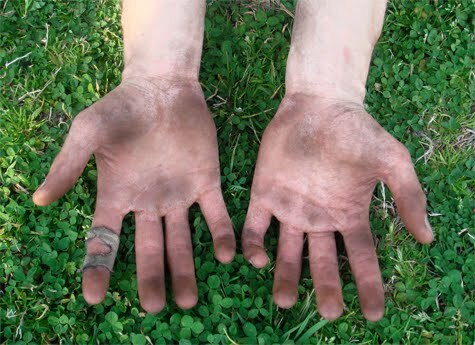 Dirty hands are an unrivaled inspiration; they tell a tale. They say “I have been there”. “It wasn’t easy. Others said it was impossible, but I persisted”. The tales they tell (of victory, of defeat) are their own! That’s why people follow them: to learn from that true leader how to become one! There’s only one way to lead. It’s from the fore; by example – with dirty hands! This entry was posted in Courage, Femi Yoloye, Gandhi, Leadership, Mandela, Obasanjo, Rasputin, Russian Roulette, Vision and tagged Gandhi Mohandas Karamchand Mahatma, History, Nelson Mandela, Personalities. Bookmark the permalink. that was truely inspiring, thanks. Guy, you really messed up, y didn't u use these skills to tush up the editorial units of EEESS and RCF, ehn? You need caning for that. But on a second thought, you'd be better off talking to a journalist or starting with church bulletins to market this gift of yours and spread the scope of this inspirational stuff with modern-style presentation. Check out my papa's blog http://www.dailyenergiser.blogspot.com and see if you can rub minds with him 'cos he has got some dirty hands too and you can add to your creative stuff too. Kudos, but please don't stop now,ok? @Marian: Thank you for reading! @Olumide: The GP-rush covered my eyes like a visor back then! Forgive me! Will def be on papa's spot. Thanx for the word. I won't stop. @Harry: Thanx. iLIKE that uLIKE@Honey: Ehhya! Humour will lengthen our lives in this "serious" world. Aren't you curious to see what I'll look like at 61? …lol. Thanx again! Imisi,bliv me, i just saved dis page to go over it again and also give friends to read. Ur writing style is bam!!! Mature!!! Modern!!! I'm in love with this piece man. U got me up,really. Making ur points concrete was da bomb man. Moooooooo…oooooore! @APJ: Who am I without you? I will work harder! Thank you so very much.
" And the applause thunders like a rainstorm in April….. this is excellent, in every comprehensible sense of the word." @Ore: Thanx a lot. I'll probably need a steel helmet at this rate! Just left your spot now – and that last post was truly amazing! Thanx again! This is extremely challenging and I'm glad I read this today. This has got to be one of the most difficult questions to answer, "There is nothing easier than pointing the gun at the head of a “rookie who won’t be missed” in Russian Roulette – but, can you hold it to yours? Can you pay the price to make tomorrow what you’d have it be? Do you get your hands dirty – or are you the guy who wears MJ-gloves while pointing and whining “hey! Dig this side well”? @Jaycee: Thank you again and again, Jaycee! @misstik: "coachie" must have learnt his lesson. You're right. Even I need to learn to put the gun to my own head – not just once in a while, but throughout life! @LDP: You have challenged me oh! I'm now looking for some "dirt" too. Thanx@L(lukitty): You're really making my head swell oh! Reaching for my steel helmet pronto! I will work my hands harder. Thanx a milli. first time here and i am hooked! i like the analogy of the leader and the bully. interesting! @DiAmOnD hawk: Thank you. You've really got a great thing going over at yours!